When you dip a sponge mop into a bucket of gray, soapy water, it’s easy to imagine the appeal of a steam mop: no bucket of dirty water, for starters, and less work on your part. Just press a button and move the mop, which heats water from a refillable tank to create steam, over your floor. Afterward, the steam evaporates quickly, so there’s less chance for streaks (or slips). “With a steam mop, you can clean your floor easily without using chemicals, such as bleach or ammonia,” says Consumer Reports test engineer Larry Ciufo, who evaluates steam mops. But steam mops don’t necessarily clean better than regular sponge mops—and they aren’t without drawbacks. A steam mop is limited by a cord, typically between 20 and 25 feet long. You’ll need to wash the detachable mop head after each cleaning, and you might not be able to clean an entire room with one tank of water. “And you should used distilled water, so you do not get a mineral buildup on the heating coils,” Ciufo says. Then there’s your floor to consider. Mop manufacturers claim the mops are safe to use on a variety of flooring, including ceramic tile, vinyl, laminate, marble, stone, and hardwood. We focused our tests on ceramic tile, which is a surface all steam mop manufacturers get behind. Some flooring brands, including Pergo and Armstrong, warn against using steam mops on their products. “Depending on the type of flooring, a steam mop may damage the floor and even void your floor’s warranty,” says Joan Muratore, a senior test engineer who evaluates flooring for CR. If possible, check with the manufacturer or retailer of your flooring for cleaning and maintenance instructions. In our labs, we compared steam mops with a standard sponge mop. Our testers noted that the sponge mop pushed more of the soil around, rather than picking it up, and that the mop head dried out quickly. But if they kept rewetting the low-tech sponge mop, it offered about the same—or better—cleaning performance than the steam mops in our tests. Still, if you need an efficient way of handling smears (think muddy paw prints or sticky baby-food spills), a steam mop might be a good addition to your floor-care arsenal. For other jobs? We test and rate vacuums and carpet cleaners, too. To test how well a steam mop cleans, CR test engineers apply three condiments that stain—ketchup, mustard, and jam—on 12x12-inch ceramic tiles. After the soil dries, we take photos, then use a machine to push the steam mop over each tile in 10 back-and-forth strokes. We use photo-imaging software to compare before-and-after images to see precisely how much soil was removed. We also measure how much steam is released from the mop over a 5-minute period—the more steam released, the better. To evaluate the steam mop’s convenience, we look at each mop’s design, noting its cord length, whether it has lights to indicate when the steam is ready or the tank is empty, and how easy it is to assemble, among other factors. Check out our steam mop buying guide to get a sense of which features prove to be helpful, and use our steam mop ratings to find the right mop at the right price. Below, reviews of some of the top steam mops from our tests, listed in alphabetical order (not by CR rank)—plus a quick look at the worst. CR’s take: If you’re cost-conscious, the PowerFresh Deluxe might be the right steam mop for you. It earns a Very Good rating for cleaning, meaning our testers didn’t see much residue after cleaning each tile. 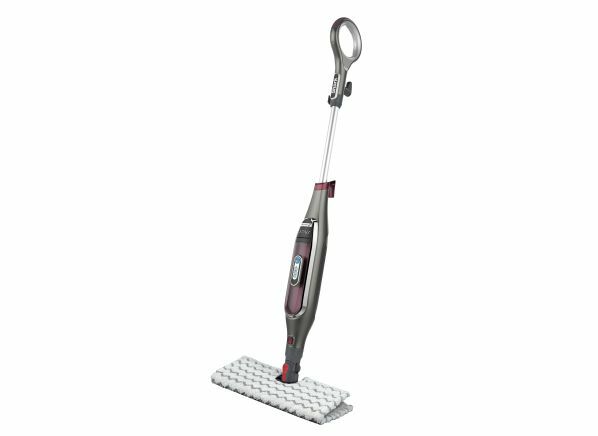 This mop has a 25-foot cord, two types of scrubbing pads, and two steam rates to choose from (meant for different types of soils). A helpful indicator light tells you when the steam mop is done heating up and ready to use. 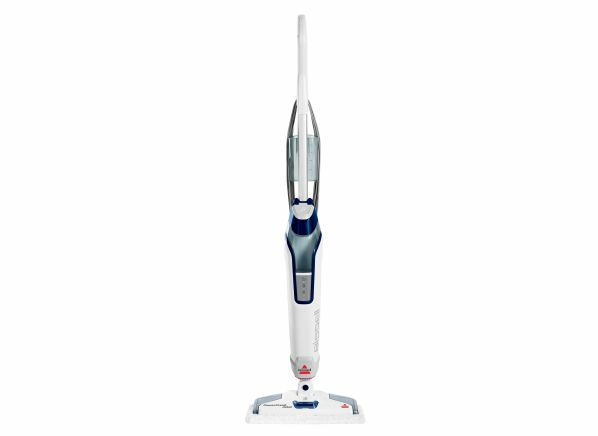 Bissell includes a two-year warranty that covers mop repairs and replacements. 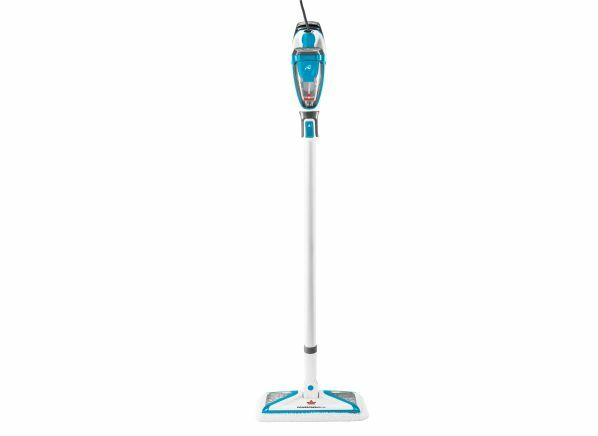 CR’s take: Best for those with a range of cleaning needs, the PowerFresh Slim comes with four mop heads (two large heads for floor cleaning and two small ones for use with the attachments). It has a 25-foot cord, which makes it easier to maneuver. 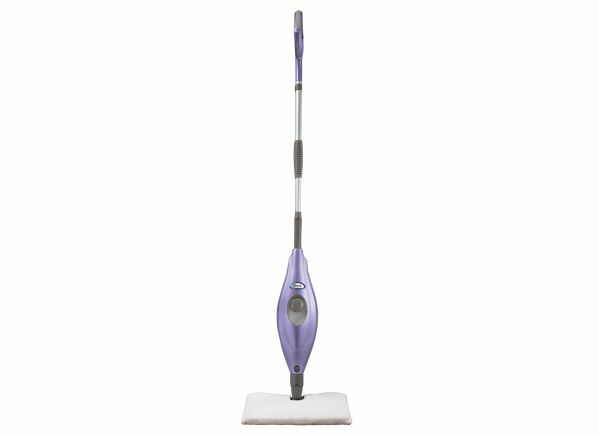 It’s the only steam mop in our tests to earn an Excellent rating for cleaning. However, our testers note that it doesn’t provide an easy way to wrap the cord for storage when you’re done. Again, Bissell includes the same two-year warranty for repairs and replacements. This mop has a ready indicator light. CR’s take: The Genius S5003D from Shark proves to be the best at producing steam for cleaning, earning an Excellent rating in our steam-rate test. It comes with two mop heads and has a unique “no touch” feature that allows you to load and unload a mop pad without grabbing it—keeping your hands grime-free. It has a 23-foot cord, slightly shorter than the longest length we found, 25 feet. There’s no indicator light, so it’s difficult to know when this mop is ready for use or when it’s out of water. Shark includes a one-year warranty that covers repairs and replacements. CR’s take: The Shark Steam Pocket S3501 sits at the bottom of our steam mop ratings, earning an Overall Score of 9 (out of 100 possible points). It’s the only mop we tested that lacks a motorized pump, which means you have to constantly pump the handle to create steam yourself. It also has the shortest cord in our ratings—20 feet (5 feet shorter than the one on the top-rated Shark Genius S5003D). The DIY pump can’t pack the same punch: It earns a rating of Poor for its ability to clean in our tests, along with a Poor rating for its steam rate. I​’m interested in the intersection between design and technology​—whether for ​drywall or robotic vacuums—and how the resulting combination affects consumers. I’ve written about consumer advocacy issues for publications like The Atlantic, PC Magazine, and Popular Science, and now I’m happy to be tackling the topic for CR. For updates, feel free to follow me on Twitter (@haniyarae).